The Vinton Community Foundation is a tax-exempt charitable organization, IRC 301 (a); that was established November 7, 1994. The purpose of the foundation is to receive and accept donations for educational, cultural, or charitable purposes. The Foundation then disburses the donations among local tax-exempt community organizations to support various projects. Though the use of these donations; the quality of life in the Vinton area is improved. Over its lifetime, the foundation has provided over $400,000.00 to nonprofit groups and community projects. Each year the foundation distributes 100% of the interest earned and any donations which are not restricted. Restricted donations are either placed into the endowment or if for a specific use – distributed for that use. The Foundation is managed by the five-member board of directors, who are appointed by various community organizations and serve limited terms. Farmers Savings Bank & Trust has made a $1,000 contribution to the Vinton Community Foundation in memory of Charles M. Yundt. Charles Yundt served as a director of the bank for 30 years. 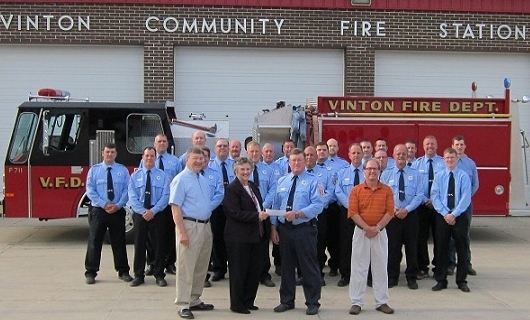 Helen Yundt knew of her husband's love for the Vinton Fire Department and asked the VCF to donate the funds from FSB to the Vinton Fire Department in memory of Charles. Accepting the check from Darlys Hulme, President, Farmers Savings Bank & Trust is Gary McKenna, Fire Chief with the Vinton Fire Department, John Yundt, and the VCF Director Rev. Phil Borleske. Gary McKenna stated, “The contribution will be used towards the purchase of a new fire truck". 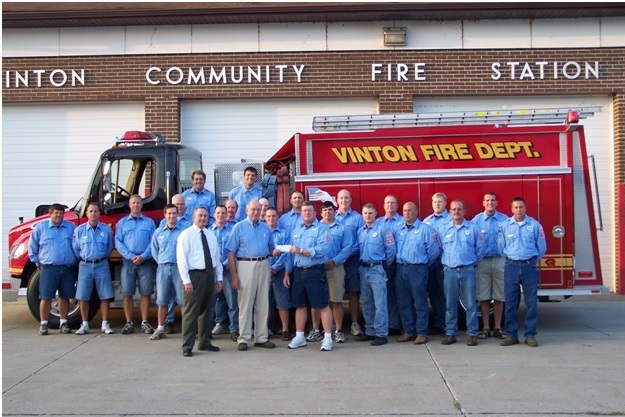 Vinton Community Fire Station receiving contribution from Directors Jim Murray and Keith Ervin.